Respect for the professional past and present of Cuevas Jiménez is clear right from the choice of the FERRATUS brand name for the wines from this family, who come from Ribera del Duero. The iron and steel structure running across the façade of their functional, contemporary winery represents a letter F written backwards and this logo has become increasingly well recognised on the Spanish winemaking scene. Although the Latin FERRATUS can be translated iron clad, the family's original objective was not to make strong wines, but rather to make the most elegant wines in Ribera del Duero. With the F of finesse. With the F of future. We collect the ripe grapes in small 15 kilo boxes. That way, they arrive whole and as clean as possible. 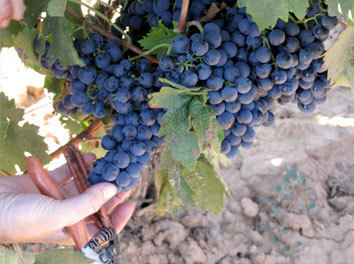 Once in the winery, the grapes first go to the bunch selection table and are stripped. We even make a second selection on the grape table, a procedure so costly and old-fashioned that it is followed only for the great wines of the world.